Davidoff will launch Champion, a new sport fragrance for men. The bottle is in the shape of a dumbbell, a "symbol of power and masculinity". Champion features notes of bergamot, lemon, clary sage, galbanum, oak moss and cedar. O my god! another one from davidoff – in 2008 adventure, in 2009 hot water, now – champion. I think they’ve decided to take the glory of 1 million and Only the Brave with a such bottle. I have still not smelled Hot Water, although I finally saw it in Kohls yesterday. At first sniff I was disappointed by Hot Water, but after some time I was imbued with it. Not bad. That’s a good runner for the “Tacky 2010 Award”. Only The Brave will have a honour prize as Supreme Tacky Bottle, however. “Symbol of power and masculinity”. Good grief, then they talk about bending genders in perfumery… Not gonna smell this soup even under torture! I don’t mind the bottle — it’s sort of funny. HA! Good one Miss Kitty! Or I got you a dumbbell because you’re such a symbol of power and masculinity..lol I dont want to say anything mean..so I’ll just keep my comments to myself about their quote to describe the bottle. Funny HaHa? or Funny HeHe? LOL! That bottle… I looks more like something from Avon, but not Davidoff. IMHO it looks like a bottle for the college jock who never grew up or out of his gold chain- wearing phase…maybe it will at least smell good! LOL…no worries, I was not offended. I smelled Champion at a Coty training last month and I have to say that it is probably the best mass market release for men this year. I am really surprised that it is called a sport fragrance as it has a lot more in common with Antaeus than Cool Water. The juice is really wonderful and has great depth with the sparkling quality of a great chypre. It was a real surprise as there releases have not been as exciting. I would encourage everyone to try this very happy development. Well that sounds encouraging. I still don’t want that bottle on my shelf, but if it’s great, I could always decant. Oh good, glad to hear it! It’s official. They have officially run out of ideas. A dumbbell? C’mon. Last year, a fist. This year, a dumbbell. I’m waiting on Avon to bring back those car bottles from the 70’s and 80’s now. LOL, I remember being so thrilled to present one of to my dad on various occasions. Mr. T should promote this fragrance. For those who hate it already, be prepared for many flankers. I am eagerly awaiting the the Champion for her, which will have a bottle shaped like a yoga mat. I’m bummed that they actually are taking dumbbell as an inspiration for the bottle. I mean, don’t take everything too literal. Creativity is not that literal. I am amused by the stapler from Paco Rabanne in early years. Then the house comes with a gold brick that awarded as some kind of the best fragrance. 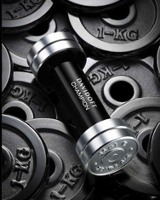 Now we have a dumbbell from Davidoff? This must be eying the best fragrance of a decade. OK. At least boys do not have to worry where to store the fragrance. Put it by the side of real dumbbells. OH MY GOD! NOOO! This bottle must be a joke! Really. Is it April 1st? Well, I really can’t believe it! 2 things came into my mind. – they collected a huge amount of men sweat and bottled it. – or they made a scent that will erase intensive body odour after work out. But isn’t that called deodorant? Hm…. The bottle looks actually pretty cool…Like when it’s eyes-catching & sleek. I usually wear le Male or Dior Homme sport, but I think I’ll give this one a try when it’s available. btw, @BChant: Do you know when it’s supposed to be released in Europe ? what do we want ?? A bottle or a perfume ?? Coty has forgotten who mr davidoff was……..This fragrance can be every popular brand ….I am getting bored,nothing new,nothing special ! Just a nice gift cause of the bottle maybe ? ?